First and foremost, let’s get this wacky masterpiece out of the way. It’s practically a wallpaper catalog and any wall not papered has some kind of painted mural on it. I love how ARGENTO uses this knotty black and white, migraine inducing background to convey that Suzy Bannion (JESSICA HARPER) is about to become entangled in a web of madness. Suzy’s pitch-dark locks begin to intertwine with the design and just as you’re thinking she might disappear, she turns a corner into another room and actually vanishes for a moment before resurfacing. 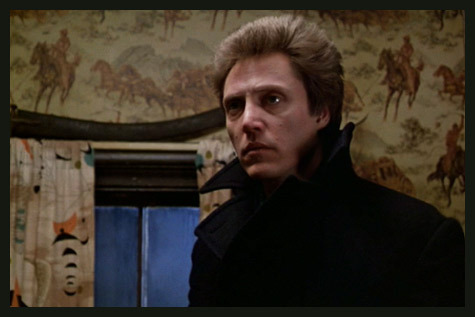 There are at least two cases of off-putting wallpaper in this DAVID CRONENBERG adaptation of the novel by STEPHEN KING. 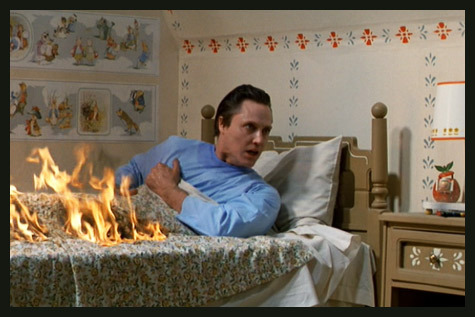 The first occurs as Johnny Smith (CHRISTOPHER WALKEN) has a psychic vision of his nurse’s daughter trapped by a fire in her cheerily decorated room. The juxtaposition of lulling imagery with the terrifying fire is positively kindertraumatic. Later, Johnny helps Castle Rock’s sheriff (TOM SKERRITT) solve a string of murders and eventually they are lead to the psychotic killer’s childhood room, which is papered in galloping cowboy heroes. 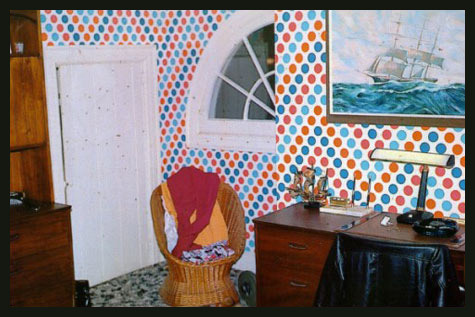 Everybody had horrifying wallpaper in the seventies. I know my parents thought paper plagued with puke-green bicentennial liberty bells was a good idea. 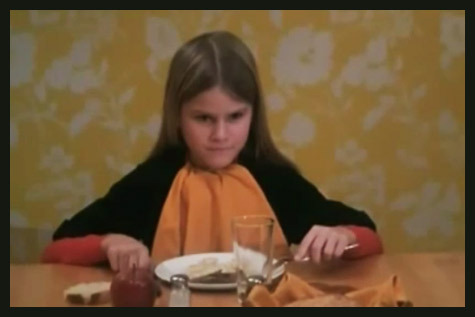 The drab designs spied in the original 1979 AMITYVILLE flick may appear especially sickly today but they were pretty much garden variety at the time. 2005’s remake musters up a faux-tacky tribute that’s easy on the eyes but too over stylized to be convincing as a real home. Not surprisingly, one must turn to reality to witness true atrociousness. 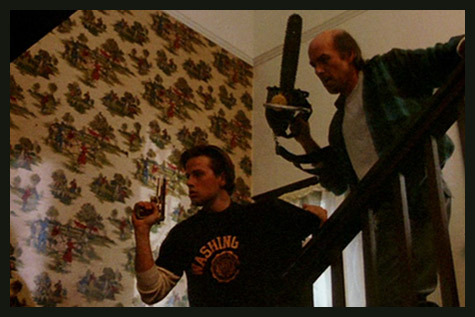 The Amityville house’s actual wallpaper as seen in 2012’s MY AMITYVILLE HORROR is far more maddening than anything ever attempted on the big screen. I get dizzy whenever I think about this movie. Some sort of effort must have went into making Cathy’s doll (that damned dirty rag!) look fetid and yet I’m sure nobody needed to alter the house’s existing wallpaper to insure it properly conveyed an overpowering presence of mold and mildew. It’s probably best that only those who dig enduring craptastic nonsense check this one out. Truth is, I almost wrote a NTT for this title about a year after I saw it because I couldn’t, for the life of me, remember its name. Just about the only thing I did remember from this backyard flick was the opening scene’s alarmingly garish orange wallpaper. It tastes like my eyes are eating chalky Bayer’s chewable aspirin. 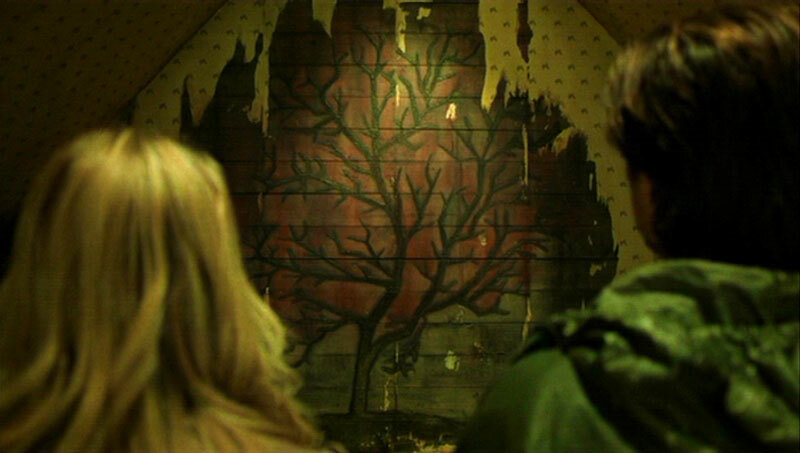 For all the relentless talk of ROB ZOMBIE’s white trash esthetic, he sure has some classy taste in muted wallpaper. Let’s hear it for DERANGED’s dainty granny print. 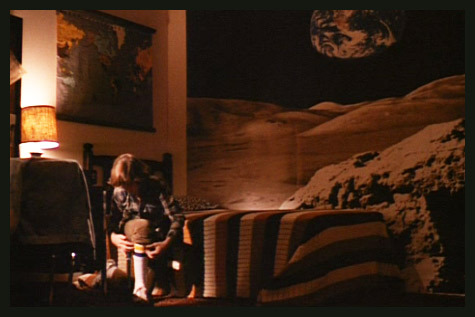 I’ve always been envious of Mike’s outer space wall mural but a recent viewing of Part 2 reminded me that flick has some groovy looking walls as well. 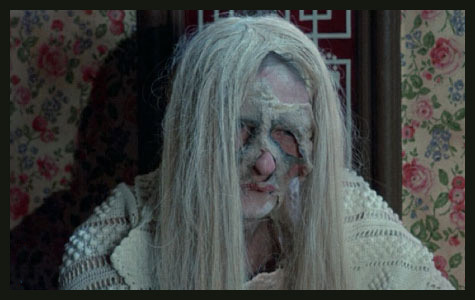 I brought this one up in an old post entitled “Seven From The Seventies.” I don’t know what it is about this bizarre Belgian/Italian co production but it never fails to give me the creeps. Maybe I should place part of the blame on the fact that the flick takes the viewer to a castle in which the upholstery on the furniture fiendishly matches the disconcerting wallpaper. It’s no wonder that an evil succubus and Satan himself hang out in such a joint. Yay! Delicious, lick-able wallpaper! BTW, JOHNNY DEPP can eat a bag of Snozberries. 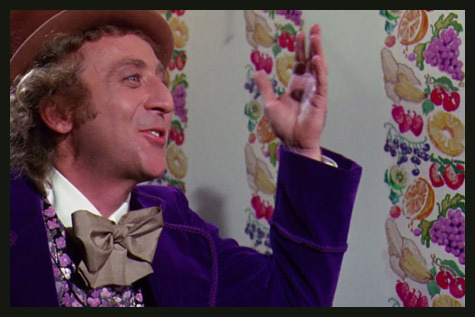 GENE WILDER will always be Wonka to me. If time heals all wounds, when am I going to get over the cancelation of THE OTHERS? If there is an alternate universe where this excellent supernatural series lasted more than thirteen episodes that is where I should rightfully live! This dimension is for the birds! In my favorite episode (which was originally aired out of order because this show can’t get a break) reluctant psychic Marian Kitt (JULIANNE NICHOLSON) moves into an apartment with elaborate green wallpaper that just happens to house a tiny nefarious demon that means to entrap her. If MIMSY FARMER is losing her mind she’s certainly chosen the right environment to do so. Are you familiar with the art of Louis Wain? Wain painted cats and some believe that as he grew more and more mentally ill, his paintings became more and more colorful, intricate and psychedelic. On the other hand, it is also possible that his work simply became more experimental. Anyway, I bring him up because I think the colorfully intricate and progressive beauty found in TPOTLIB goes a long way to convey a mental state becoming less and less anchored in reality. I might be cheating a tad here. 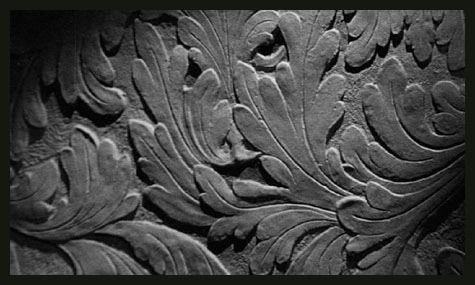 I don’t believe the notorious visage encountered in THE HAUNTING actually appears in wallpaper but rather some kind of textured tile relief. Still, I’d me remiss not to mention it, as it is the king of decorative menaces. Director ROBERT WISE brilliantly utilizes the phenomena of pareidolia to lead the viewer towards perceiving a terrifying presence and perfectly captures that moment in fear when one looses trust of their senses. 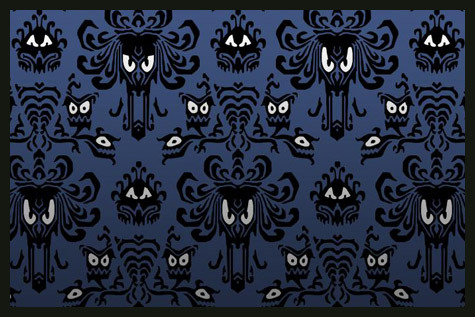 No discussion of scary wallpaper can be complete without mentioning this classic short story by Charlotte Perkins Gilman. Gilman who suffered from depression wrote this tale to illustrate to her doctor that productivity was more beneficial to her than the stifling rest he prescribed. In doing so she created something that operates not unlike the wallpaper the story centers upon, a seemingly infinite tangled miasma for readers to project their own psyches upon. There have been a few cinematic adaptations of this haunting work but I’m going to thrust upon you the 1948 radio version performed by AGNES MOOREHEAD because AGNES MOOREHEAD is the coolest. If you’re not a fan of ambiguity, this episode from the Twilight Zone reboot should do the trick. DEBORAH RAFFIN (GOD TOLD ME TO, THE SENTINEL) stars as a mental patient who will not tolerate patterns of any kind. That’s because once upon a time she saw a face in one and she’s rightfully fearful of the entity’s return. 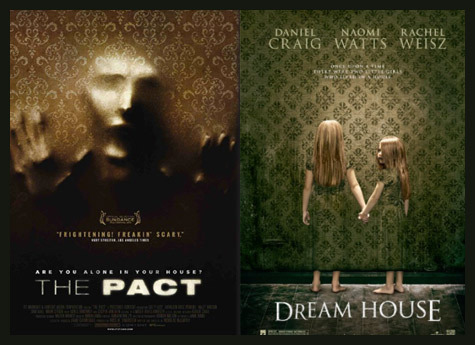 Wallpaper figures prominently in the poster art for both a brilliant independent film (THE PACT) and a totally forgettable pile of Hollywood muck (DREAMHOUSE)! Remember how this South Korean psychological horror flick had the most beautiful wallpaper based opening credits ever? As the print’s flowers dislodge and float about, we’re given an early warning of the fluidity of perception. Hey, this isn’t wallpaper! 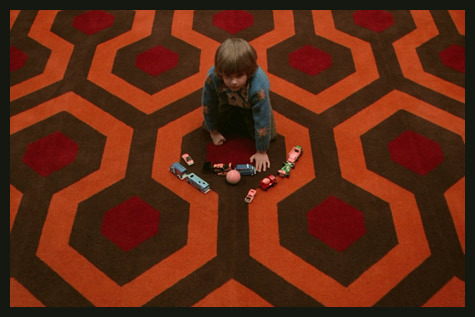 It’s a frickin’ carpet! Oh well, I don’t care. The pattern is used to reflect a disoriented, ‘lost in a maze’ state of mind and so I’m including it. But now having flipped the subject onto the floor it’s surely the time to stop. 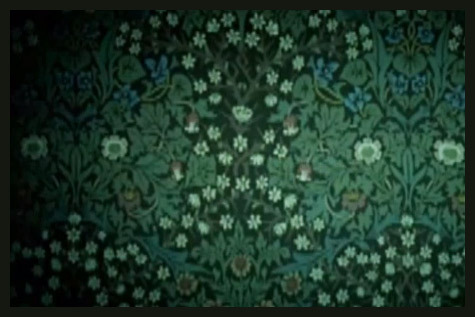 Some of the patterns we looked at were featured in films by random chance and some were surely painstakingly thought out choices by a filmmaker who wanted to express something specific. The important thing is that while we were discussing all of this Kindertrauma Kastle has been freshly papered! 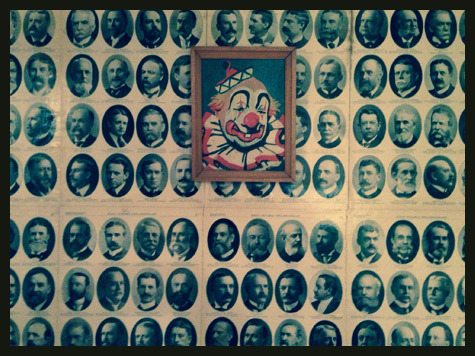 We have chosen to plaster the walls with images of great Philadelphians! There’s nothing more relaxing than sensing a hundred or so dead eyes following you! All are lovely! Too many to choose from! 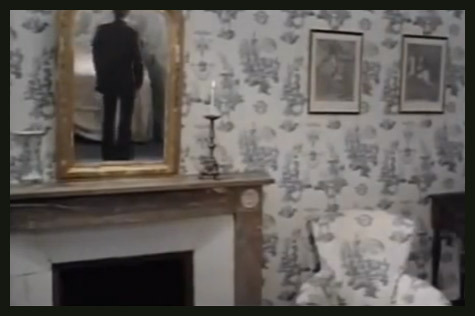 Of course, I am partial to the wallpaper in Frank N Furter’s mansion. Also, Jessica Harper was in the sequel, Shock Treatment. And I am in love with her. 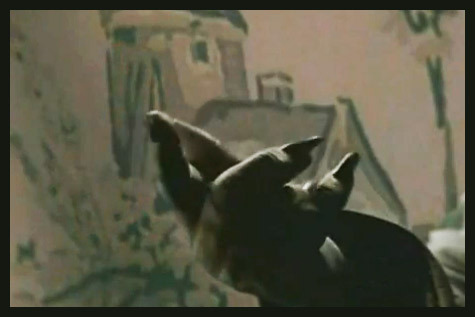 Dude – you left out the spooky whispering wallpaper from LET’S SCARE JESSICA TO DEATH (1971)…horrified me as a kid…and couldn’t we hear similar whispering behind the walls in DON’T BE AFRAID OF THE DARK (1973)? And in several episodes of GHOST STORY or CIRCILE OF FEAR, and NIGHT GALLERY? Have downloaded all of the GHOST STORY/CIRCLE OF FEAR episodes since the recent post about them, by the way — brought back many traumas from my youth…thanks! I think. Harper is so awesome in SHOCK TREATMENT and RHPS is a great addition to the lest! You’re right, LET’S SCARE JESSICA is filled with creepy paper! I wish I thought of that! Good choice. So glad you’re enjoying GHOST STORY/CIRCLE OF FEAR too. 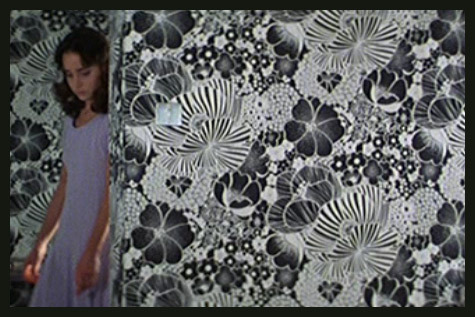 There is some truly frightening and hideous wallpaper in Dr. Butcher MD/ Zombie Holocaust. oh man! this is soooo fab!! 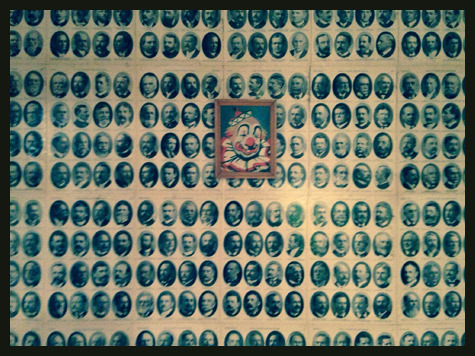 i absolutely LOVE that wallpaper in Tale of Two sisters! 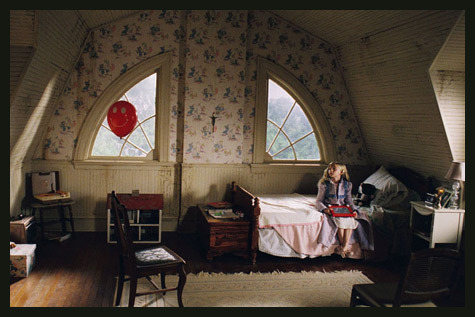 and the Amityville wallpapers are so great too! 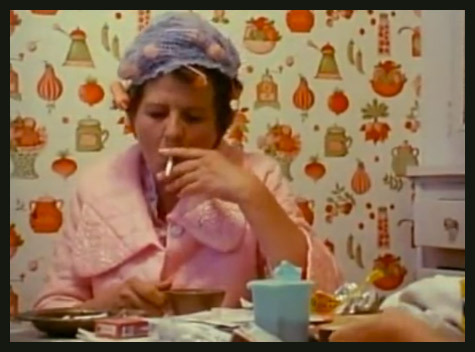 Our kitchen in the 70’s had the *exact* same wallpaper in The Offering. We also had the Avacado green fridge,stove and dishwasher to match!